KIEV, October 12. /TASS/. Russian and Ukrainian experts have warned of disastrous consequences that the decision to grant autocephaly to the Ukrainian Orthodox Church may entail. Although the Holy and Sacred Synod of the Ecumenical Patriarchate stopped short of granting autocephaly to Ukraine on Thursday, the second day of its three-day meeting, it has announced the decision to lift the anathema against leaders of two extracanonical churches in Ukraine - Filaret of the Kiev Patriarchate and Makariy of the Ukrainian Autocephalous Orthodox Church. It also announced its determination to revoke the legal binding of the Synodal Letter dated 1686, which granted the right to the Patriarch of Moscow to ordain the Metropolitan of Kiev. Ruslan Bortnik, who heads the Ukrainian Institute for Analysis and Management of Policy, told TASS that the Ecumenical Patriarchate’s decision de-facto meant a start of a direct conflict with the Russian Orthodox Church, and created preconditions for a systemic religious conflict in the country. 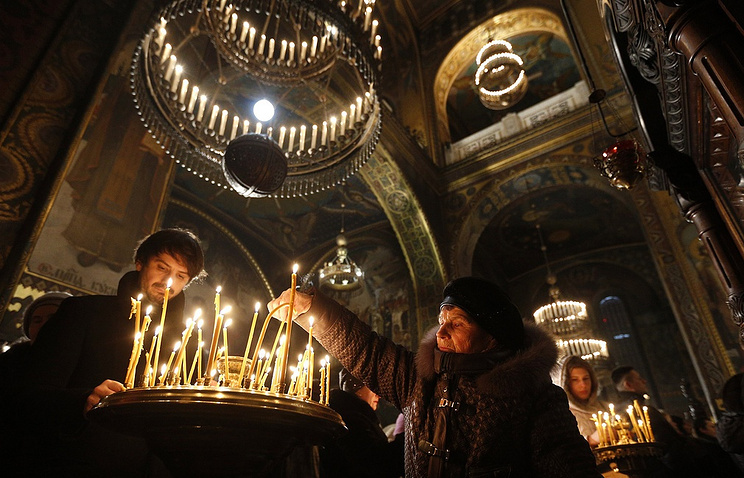 "Anyway, the Ecumenical Patriarchate has started a direct conflict with the Russian Orthodox Church by lifting the anathema and refusing to recognize [the Russian Orthodox Church’s] right for control over the Ukrainian territory," he said. Another expert, head of the Third Sector analytical center Andrei Zolotarev, said the Orthodoxy worldwide is now facing what he described as "the most serious religious split in centuries." "It is also clear that this will provoke a conflict and split the global Orthodoxy," the expert said. "It is evident that Patriarch Bartholomew’s decision was made under pressure from Washington. However, the United States is yet undecided on whether it should support [incumbent Ukrainian President] Petr Poroshenko [during the next year’s presidential race], otherwise the matter would have been solved far quicker." According to Bortnik, the Ukrainian government’s stance on the issue would have a great impact on further developments in the process of creating a unified Ukrainian church reporting to the Constantinople Patriarchate. "If the state gives its protection to only one side, if politics and radical groups become embroiled in this process, open confrontation and large-scale religious conflicts are possible," the expert said, adding that the issue is highly likely to become politicized, considering the upcoming 2019 presidential and parliamentary elections in Ukraine. Russian expert Roman Lunkin, who is the director of the Institute for Religion and Law, said the country’s believers would undoubtedly react to Constantinople’s decision. "One may expect that the believers will take some measures in response, in order to protest or to protect themselves, therefore, bloodshed and clashes would follow. The responsibility for them would lie solely on Patriarch Bartholomew, who certainly realizes how highly flammable is the substance to which he is now setting fire." According to Zolotarev, the move would trigger an all-out conflict among various religious organizations in Ukraine. "The decision of the Ecumenical Patriarchate’s Synod will serve as a trigger to escalate religious tensions in Ukraine. Despite the call to avoid the seizure of churches and other acts of violence in Ukraine, it is evident that churches would inevitably be seized," he said. Bortnik, in his turn, agreed that religious tensions in Ukraine are likely to result in a conflict over church property. "The risks of a systemic religious conflict are huge, especially in connection with the fight for ownership of [the country’s two major monasteries] Pochayiv Lavra and Kiev Pechersk Lavra," he said. "Anyway, the floodgates to conflict have been opened." Political expert Dmitry Razumkov told Ukraine’s Pryamiy kanal TV that "the state must play the key role in maintaining law and order" during the turbulence that the Ukrainian autocephaly process may entail. "It is very important that the authorities and, first of all, the law-enforcement agencies firmly respond to any speculation like ‘is this church now ours or not?’" he said. Currently, Ukraine has one canonical Ukrainian Orthodox Church, which is a self-governing church constituent of the Moscow Patriarchate. There are also two religious organizations not recognized by the Orthodox Christian world - the Ukrainian Orthodox Church of the Kiev Patriarchate and the Ukrainian Autocephalous Orthodox Church. The Ukrainian authorities have tried to create a Local Orthodox Church independent of the Moscow Patriarchate on numerous occasions since 1991. In November 1991, Filaret, who was then heading the Ukrainian Orthodox Church of the Moscow Patriarchate, called for granting the Ukrainian Church autocephalous status. In May 1992, he was demoted from his post as head of the local church. However, Filaret failed to comply with the decision of the Russian Orthodox Church and, with support of Ukrainian officials, announced the creation of the Ukrainian Orthodox Church of the Kiev Patriarchate. In February 1997, he was excommunicated and anathematized for sectarian activities by the decision of the Russian Orthodox Church’s Assembly of the Hierarchs. In April 2018, Ukrainian President Pyotr Poroshenko addressed Ecumenical Patriarch Bartholomew of Constantinople with a request to grant autocephaly to the Ukrainian Church. On September 7, the Ecumenical Patriarchate of Constantinople, as part of preparations for providing autocephaly to the Ukrainian Orthodox Church, appointed its exarchs (envoys) in Kiev, which is the Moscow Patriarchate’s canonical territory. On September 23, Patriarch Bartholomew said during a Divine Liturgy in Istanbul that Ukraine has the right to obtain autocephalous status, while the Patriarchate of Constantinople has the sole right to provide autocephaly. The Holy Synod of the Russian Orthodox Church responded by saying that Constantinople’s actions were a crude violation of church canons and stopped mentioning Patriarch Bartholomew during church services and conducting joint services with Bishops of the Ecumenical Patriarchate.